Happy Valentine's Day! Got any plans? Not us, we'll wait for another time when there are no crowds to go out to eat. I stamped the image on kraft, then colored it with copics. I added some shimmerz to the hearts, but you can't see it in the picture. ALL UNITY STAMP COMPANY STAMPS AND HANDLES 10% OFF! Basic Grey Bittersweet Rub-on Olio Books and Element Stickers! Very, very pretty! 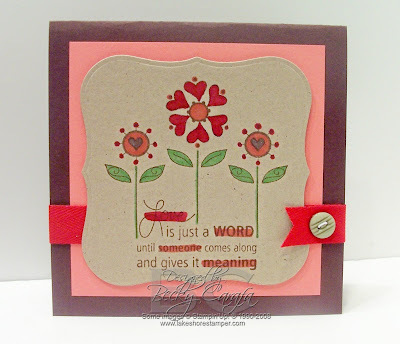 I love how you used the top note and stamped your images on Kraft! Great job! Darling card!! Happy Valentine's Day, friend!!! ooh love this! Happy heart Day Becky!! It does get a bit busy on Valentines. We're going to an early dinner to avoid the crowds!! Hope you have a happy Valentines nonetheless!! Love your pretty card. The flowers are so pretty and I love how you highlighted the words!! What a great idea! !